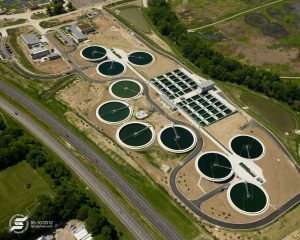 The Board of Trustees of what is now known as the Sangamon County Water Reclamation District (SCWRD) believed that modern automation technology could turn their vision of a larger, smarter, more efficient wastewater plant into a reality. At the recommendation of their engineering firm, Crawford, Murphy & Tilly (CMT), SCWRD contracted SCADAware to design a SCADA system that would meet, and eventually exceed, their articulated goals. SCWRD serves over 150,000 people in the Springfield, Illinois metro area, including the regional communities of Chatham, Grandview, Jerome, Leland Grove, Rochester, Sherman, and Southern View. Replacing their Spring Creek and Sugar Creek facilities became a priority for SCWRD, then known as the Springfield Metro Sanitation District (SMSD), due to the conditions of excessive service demand, increasingly strict environmental regulations, and aging equipment and operating systems—all of which were taxing the existing waste treatment infrastructure. Couple a growing community with new environmental laws. Then add to that the age of the plants. You reach what they call in our business, ‘the knee of the curve.’ Trying to spend money on an old facility becomes impractical. All of these factors together added up to the district finally making the hard decision to build two absolutely new facilities. 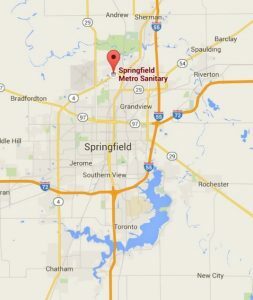 The district’s service area has expanded over the years, taking in the aforementioned neighboring communities adjacent the original Springfield metro service area. This radically increased service demand was taxing the existing plants. Measured as an annual average, the recommended flow capacity at the Spring Creek facility had exceeded its original limit of 20 million gallons per day (MGD) since 2004. While the Sugar Creek plant had not yet exceeded its original design flow capacity of 10 MGD taken as a yearly average, monthly average flow measurements often surpassed that recommended limit. It was clear that both plants were operating well in excess of their organic and solids design capacities. 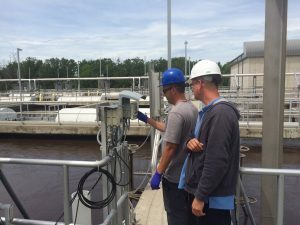 Environmental law is steadily evolving, and new incentives have been created since the plants were built and last renovated to meet mounting environmental challenges, such as reversing the hypoxic effects of the Gulf of Mexico’s “Dead Zone.” As part of this initiative, manufacturers along the Mississippi are being required to decrease their discharges. Meeting regulatory demands such as this requires new technology that didn’t exist when SCWRD’s Sugar Creek and Spring Creek plants were built and last renovated. Of SCWRD’s two plants, Sugar Creek is more modern; its construction was completed in 1973. Spring Creek, the original plant, was built in 1928. It was modified in the 1950s, 1970s, and again in the 1990s in costly attempts to maximize its efficiency and keep up with increasing service demand as well as environmental regulations. The first of SCWRD’s two plants slated to be rebuilt was the Spring Creek facility, an 80 MGD treatment plant with 40 MGD storm overflow. SCWRD’s Board of Trustees tasked their management with building a “smart plant.” The new plant would have to be doubly as efficient as the existing Spring Creek facility, and much larger, but without significant increases in staffing or operational costs (such as electricity). This would ensure the best return on the investment of the capital cost of building a new plant. To accomplish this ambitious goal, cutting-edge automation technology and treatment methods would need to be employed. CMT’s consulting engineers were awarded the civil and site work design as well as construction administration assistance services for the project. Together with SCWRD’s in-house engineers, they set out to build a state-of-the-art plant, and because optimizing technology was such a vital component to their plan, CMT and SCWRD agreed that the early involvement of a specialized system integration company was crucial to the success of this venture. CMT has often hired system integrators, but this was the first time it had involved one from the very beginning of a project. CMT had already planned to use the Wonderware platform as the Spring Creek plant’s SCADA software. Using online research and its Quality Based Selection vetting system, CMT selected SCADAware from its list of Wonderware-certified prospective firms. SCADAware’s programmers were chosen for their experience in SCADA system design and development, their expertise in cross-industry and cross-automation platforms, as well as their nonpareil service standards. SCADAware’s role in the project was to deliver the complete SCADA system. Initially, SCADAware provided preliminary engineering assistance to CMT in preparation for the bid and construction documents. After the bid, SCADAware’s involvement with the project included SCADA system design engineering, implementation, in-house testing, onsite startup, documentation, and closeout/training. SCADAware was also tasked with meeting all of the panel design and fabrication demands of the new plant. SCADAware Senior Electrical Engineer, Josh Niemi, P.E. 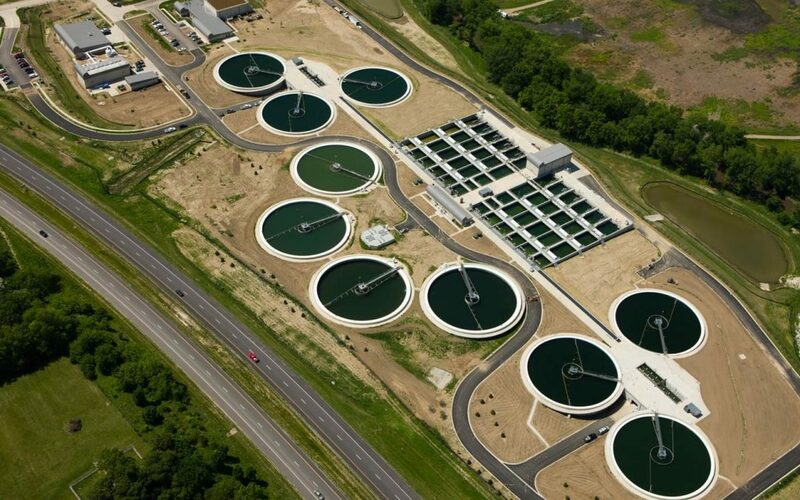 New wastewater treatment facilities consist of equipment from various manufacturers. Coordinating communication between these suppliers’ equipment and establishing programming standards are top priorities in the successful function and efficiency of the Wonderware system. Due to their early involvement with the project, SCADAware’s programmers were able to understand and offer professional guidance concerning SCWRD’s unique efficiency, monitoring, and control goals. SCADAware provided dedicated project managers and participated in regular project status meetings with CMT and SCWRD, the outcome of which was a control sequence of unmatched efficiency. A factory acceptance test (FAT) was successfully conducted at SCADAware’s home office. 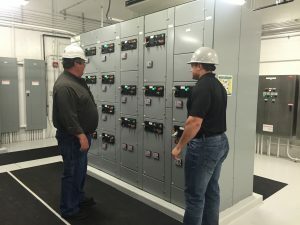 Their programmers then ensured that the plant’s PLCs would follow the tested control sequence, utilizing Ethernet communication to OEM systems. The finalized functional specification served as a guideline by which SCADAware’s programmers developed the SCADA and control systems for SCWRD’s Spring Creek facility. The specification document was designed with maximum comprehensibility in mind, so that the system could be configured without much additional information during the development phase. This building plan view, depicting the plant influent in the Headworks building (Figure 1), consists of three screen channels, a bypass channel, and two grit chambers. With Lead/Lag operation, one screen channel is always operating, and additional channels are opened and called to operate based on influent level. Through this display, operations personnel can monitor plant influent flow, screen channel levels, motor operation, and gate positions. The process can be controlled by adjusting Lead/Lag channel assignments and level set-points. Operators can select a given individual piece of equipment on screen to display relevant information about its operation. The pop-up display of Course Screen Grinder 1 represents a standard motor control window (Figure 2). 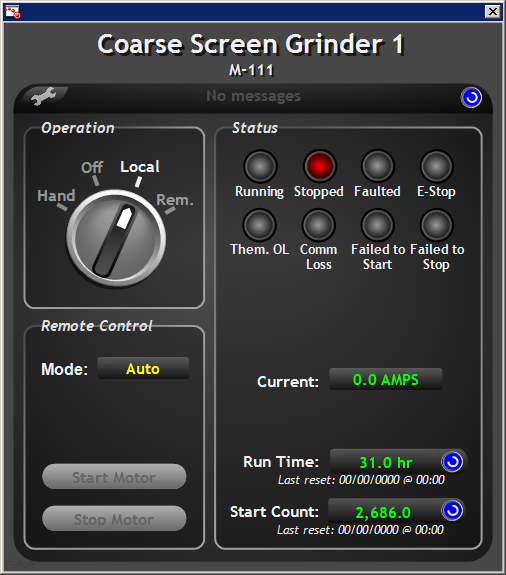 Using this screen, operations personnel can monitor the control switch position (hand, off, local, or remote), operation status (running, stopped, faulted), and motor parameters (current, run time, start count). In auto mode, the motor is automatically controlled by the process; in manual mode, the motor is stopped and started directly from the SCADA workstation. After flow has moved through the Headworks building and into a wetwell, the pictured influent pump station (Figure 3) moves it up through a headbox to gravity-flow through the rest of the plant. Seven pumps work in tandem using Lead/Lag operation to maintain a wetwell level and provide flow to the plant. Through the influent pump station display, operations personnel can monitor wetwell level, pump operation, and pumped flow. Wetwell level set-points and Lead/Lag pump assignments are adjustable. In the event of a failure in the automatic pump control, a backup float system (which can also be monitored through this display) automatically takes control of the pumps. The SCADA system at SCWRD’s Spring Creek facility primarily controls process equipment, monitors OEM equipment and processes, records process data, and provides alarming for fault conditions. Alarms are categorized by severity, which gives the system the flexibility to self-correct for out-of-bounds process conditions before escalating to an after-hours alarm call. The system annunciates alarm conditions through the SCADA screens and also provides telephone alarms through a software alarm dialer that functions during times when the plant is operating unmanned. The Spring Creek plant’s SCADA system monitors approximately 20,000 data points, including information from the Remote Terminal Units (RTUs) at SCWRD’s 32 lift stations and 50+ PLCs. System users include plant operators and supervisory personnel. Operators interface with the SCADA system through the main operator station in the control room and can also control the system through industrial PC panels in process buildings. SCADAware was an invaluable part of our team in optimizing operational performance with automation technology at our new plant. From an operational standpoint, our challenge in building a new facility that would double our capacity was to find a way to get it done without simply doubling everything—labor, energy cost, etc. We needed to build a smarter plant. SCADAware’s expertise in SCADA systems and integrating many different types of technologies exceeded our expectations of what we could accomplish. In many cases, operators don’t know what kind of information they will need until they need it. By way of a general example, if there is a problem with one data point, a diligent operator might want to generate a report on that data point from the past three days for comparison. Prior to the implementation of the SCADA system, these data simply were not available to the operators at the Spring Creek facility. Under the old system, it regularly proved too costly and time-consuming to collect large amounts of data manually for a “just in case” scenario. With the SCADA system, an operator can build a report with just a few clicks. Operators are able to easily obtain the information they need to make better decisions and timely adjustments that maximize efficiency. Before the SCADA system, if there were problems, you would not have the information on how bad [a] problem was or where [a] problem was, so you had to overcompensate—not only with equipment. You also had to overcompensate with manpower. Having this information at [our] fingertips with the SCADA system, our operators are high-performance operators able to make informed judgment calls based on real-time, accurate information. The SCADA system handles most minor, minute-by-minute adjustments so that operators can focus on the overall functioning and efficiency of their plant. The adjustment of guidelines and set-points is easy, and the automation system will ensure that processes are operating according to these set-points constantly, not just calibrating to them a few times per day. The SCADA system has simplified reporting—to the US EPA, Illinois EPA, as well as trustees—for SCWRD. At the Spring Creek plant, these reports are automatically generated each month by the SCADA system. Additionally, a flow report summarizing daily key flows can be generated on demand and used for EPA reporting. All process meters (ex. flow, level, pressure) are programmed with a standard minimum/maximum/average statistics function via the PLCs. The PLCs also track total flow for flowmeters and total usage for chemical tote scales. Generated statistics for any meter are easily resettable. 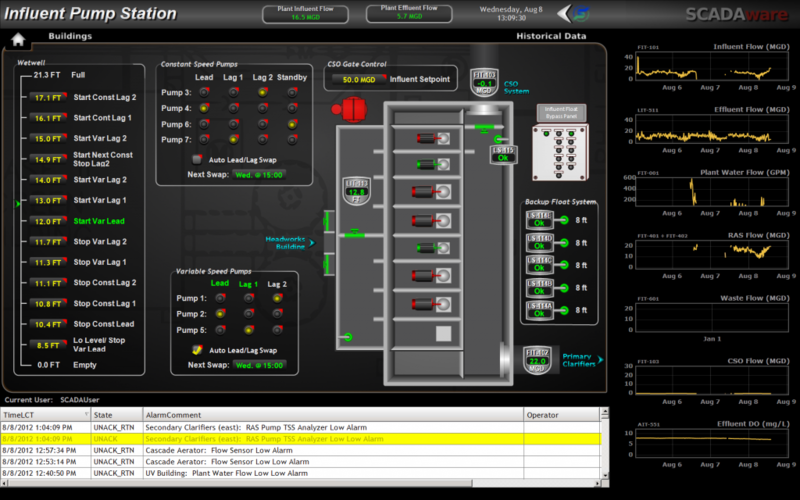 Typically, an operator will record daily flows at the SCADA workstation and then simply click a button on each flow meter popup window to reset each one. The process of recording daily flows for each flow meter takes about 15 minutes. Previously, it could take as long as two hours for an operator to physically walk the plant to gather and record the same data. The dissolved oxygen (DO) concentration of a water treatment facility’s discharge drastically affects the health of the receiving stream—in this case, the Sangamon River. The State of Illinois requires SCWRD to conduct a daily test to determine whether the DO level of the flow directed to the receiving stream is within acceptable parameters. Thanks to the advances in instrumentation and programming implemented during the rebuild, the DO level of the Spring Creek facility’s receiving stream is monitored in real-time and recorded to a reporting database once per minute. This attentive monitoring protects the Sangamon River and works to ensure its long-term environmental health. In the past, Spring Creek plant operators relied on analysis reports of samples to make judgment calls on possible changes in certain plant processes. Such a procedure, from taking the sample to being handed the results of its analysis, could take hours—and this was often the only data immediately available to an operator when considering a given course of action. The SCADA system has greatly reduced labor hours previously allotted to manual analyses of plant processes by SCWRD staff and has greatly increased the spectrum of data on demand. 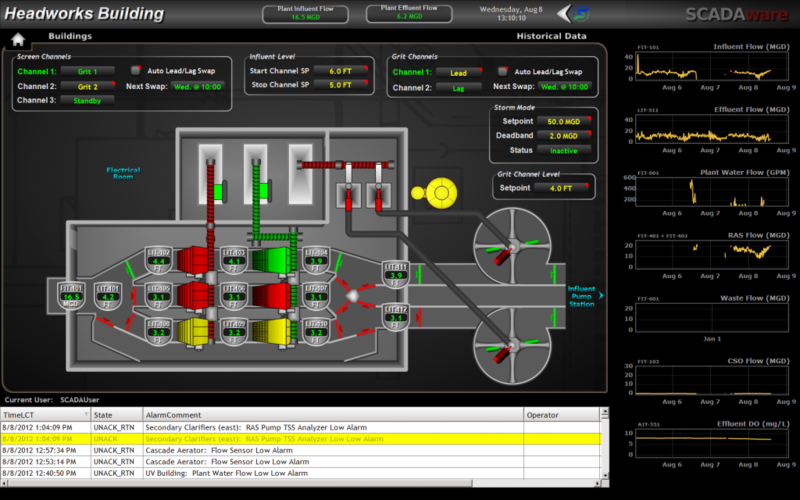 Online instrumentation reports to the SCADA system, giving SCWRD real-time data pertaining to plant processes. Timely reports on solids levels and solids concentration, for example, are easily generated. All data, including motor start/stop counts, are stored in a database that can be accessed at any time using SQL queries. Any data that is made available to the SCADA system can be stored and retrieved in this way. 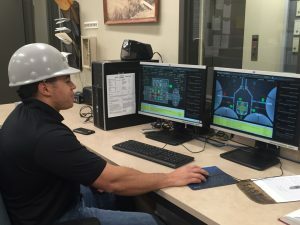 Maintenance-related data are pushed from the SCADA system to the Spring Creek facility’s maintenance system so that work tickets are automatically generated as plant equipment ages. To ensure continous, safe, and efficient plant operations, the SCADA system uses an outbound connection through the administrative network that allows plant supervisors to remotely monitor the entire system from their laptops at home. Although supervisors cannot adjust settings remotely at this time, SCWRD intends to allow write access once the Sugar Creek plant is completed in 2017. This will give supervisors full control of all automated processes remotely. Plant supervisors’ cell phones use an alarm software application that alerts them and allows them to remotely acknowledge any current alarms in the system. …uses labor efficiently. The Spring Creek facility uses a crew of seven operators and two head operators for the first two shifts. The SCADA system runs the third shift. Using the old system, this facility would have required an operating crew of at least 28. …empowers operators to report effectively. It is now cost effective for operators to collect large amounts of data for “just-in-case” scenarios. Reports can be built with just a few clicks. The SCADA system also generates reports automatically at the end of each month, which makes mandatory reporting to the U.S. Environmental Protection Agency (EPA), Illinois EPA, and SCWRD’s trustees simple. In addition, the system reports once per minute on dissolved oxygen (DO) levels for water entering the Sangamon River, far exceeding the State’s current reporting regulations and anticipating future requirements. …automatically tracks and addresses maintenance needs. Work tickets for aging plant equipment are automatically generated using data pushed from the SCADA system to the Spring Creek facility’s maintenance system. …saves energy. SCWRD is running a plant twice its original size but with a slightly lower yearly energy bill than before the rebuild. …facilitates remote monitoring. Plant supervisors can monitor the entire system through their cell phones, which provide notifications and allow supervisors to remotely acknowledge system alarms. …comes packaged with unparalleled support. SCADAware has an ongoing support and service contract with SCWRD. Using SCWRD’s administrative network, SCADAware programmers are able to log in to a terminal server on the plant network to diagnose and correct problems with the SCADA system. SCADAware has an ongoing support and service contract with SCWRD. Knowledgeable programmers are available to help SCWRD operations management address any system problem promptly. Using SCWRD’s administrative network, SCADAware programmers can log in to a terminal server on the plant network to diagnose and correct most problems with the SCADA system. Remote access to the system was set up by the Spring Creek facility’s IT personnel and requires multifactor authentication, guaranteeing the security of the plant’s system. The number of customers SCWRD serves in Springfield and surrounding areas. 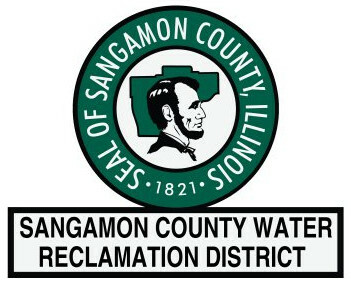 The Springfield Metro Sanitary District changed their name to the Sangamon County Water Reclamation District to reflect the expansion of their district to include more and more customers beyond the Springfield metro area. The updated, effective methods through which the facilities operate are part of a shift in thinking away from merely “treating” water and toward “reclaiming” water as a valuable and powerful resource. The peak flow capacity at the Spring Creek plant. The projected peak flow capacity at the Sugar Creek plant, which is expected to be completed by September 2017. The diameter of the clarifiers at the Spring Creek facility, which are designed to handle about 25 million gallons per day! The number of ultraviolet lightbulbs that water passes by during the final stage of the treatment process. The distance that water is pumped after treatment from the Spring Creek facility to the Sangamon River. The number of equipment pieces controlled by the SCADA system, including pumps, valves, mixers, aerators, gates, boilers, etc. The number of additional inputs monitored by the SCADA system, including online analytic instrumentation, level sensors, temperature sensors, flow meters, and human interface inputs.